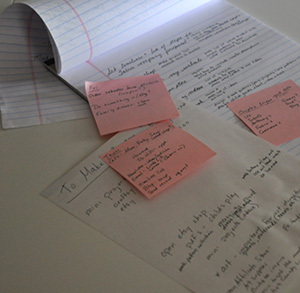 Today I am in “list-making” and “planning” mode. Last night, I went to bed at my usual time around 10 p.m., but I just couldn’t get to sleep. So many thoughts and ideas racing through my mind. I guess when your brain gets into that really relaxed state without any distractions, it just gets super creative. I love the creative ideas that I come up with during these late night bouts of insomnia…. but I wish I could have these ideas during the day when I’m already up! On my About page, I say that I do my best thinking at 3 a.m., but really it happens just about any time I am trying to fall asleep or wake up in the middle of the night and can’t get back to sleep. So last night, after about an hour and a half of not being able to turn my brain off, I decided that I might as well just get up and write stuff down and get it out of my head. 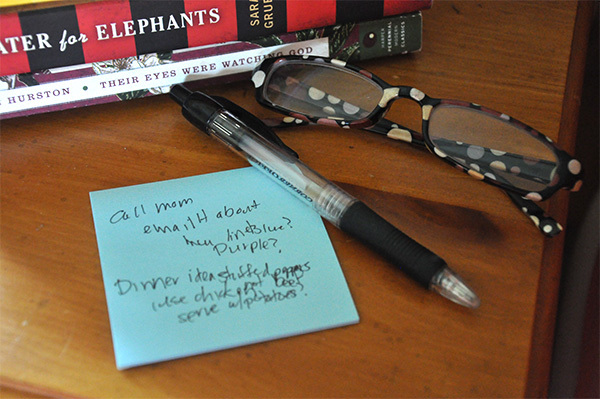 I came downstairs, grabbed a legal pad and a couple of pads of Post-It Notes, and started my “brain dump.” Today I need to organize and make sense of all those scribbled down notes. They include new project ideas, some older ideas that I really need to just start working on, phone calls and emails I need to do today, plan for hosting a couples’ night here at our house, plans for stuff to do with my daughter tomorrow, technical stuff that I need to do with my website, ideas for ministry stuff that I’d like to do at my church…… See??? Total BRAIN DUMP!!!!!!!! The thing is, I should get up in the middle of the night more often! It is really when I do my best thinking. Unfortunately, it requires the need for extra caffeine the next day… And now I need a couple of clones of myself to accomplish everything on my list…..
*Do you have a time when you do your best thinking? When you are most creative? *What do you do when you can’t fall asleep at night, or when you wake up in the middle of the night? Do you lay there for hours hoping to fall asleep? Count sheep? Get up and do something else?? By the way- look at what some of my peeps have been up to! Connie at Freemotion by the River made this Christmas-y table runner from my Happy Town fabric line. Honestly, I never would have thought to use the red and green prints in the line for a Christmas project! 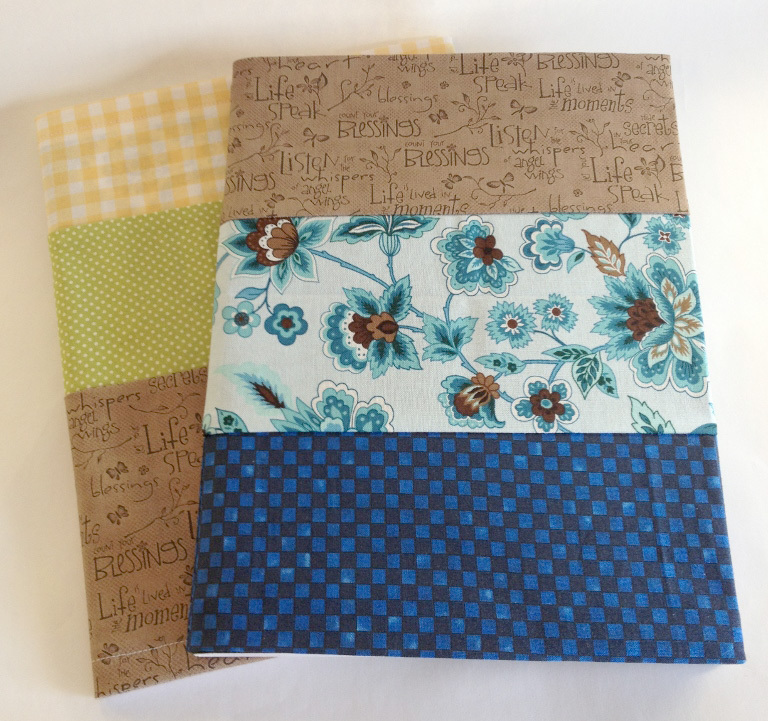 And Sandy at Upstairs Hobby Room made these fabric covered notebooks from one of my tutorials. They came out so pretty! If you have made a project using my fabric or patterns, send it to me and you may end up on my blog and/or Facebook page! This article was posted in Art-Design-Business. Bookmark the permalink. Follow comments with the RSS feed for this post.Post a Comment or leave a trackback: Trackback URL. This is too funny! I definitely do not do my best thinking in the middle of the night, but I know I can’t schedule the best times to think as well – sometimes things will “hit” me while I am in the grocery store, or driving somewhere, or in the shower (places where I can’t write stuff down!). If I wake up in the middle of the night, I usually just lay there and hope that I will eventually get back to sleep. Sometimes I don’t and then end up really tired the next day (I guess like you are today – but I didn’t get a page full of notes like you did!). Oh yes- I forgot about the shower! That is a great place for coming up with ideas! BTW- I ended up with about 3 pages of notes!!! No wonder I couldn’t sleep- my brain was in hyper-drive!! I’m like you!! It just comes when it comes!! I am learning to take a picture with my phone or put a note in my phone to remember for later! Funny thing… I’m using the Blue Blessings book shown above to write down all my ideas and projects I want to accomplish!! Thanks for the tutorial!! I haven’t slept all night in a long time. I usually wake up around 3:30 and I just lay there and think until it gets daylight. My best ideas come to me at this time of night. I “design” things in my head.I think it is because everything is quiet and there isn’t anything to disrupt my thoughts. Then in the morning, I don’t have any problems putting everything down on paper. I wish I could remember everything in the morning! I have to get it all down on paper before I go back to sleep! I sleep well about half the time- the other nights I either have a hard time falling asleep, or I fall asleep and then wake up. If only our brains had an “off” switch…. Oh boy, do I ever recognize that kind of note. I have done the very same thing. I would put my finger between the lines so my thoughts wouldn’t run together and they still looked just like yours. Funny. I never seem to have a problem sleeping. LOL I wake up, but a change of position is usually all I need. I do think about quilt designs as i fall asleep every night, but I usually remember them too. Sorry I can’t be any help to you! Love the covered notebooks! Sandie, it seems the more I design in my head, the more awake I become! I don’t know how you fall asleep while thinking about quilt designs! LOL Sounds like there are a lot of us that can’t sleep like we used to…we are all creative, apparently, or at least we can say that, instead of saying we are fabric addicts! 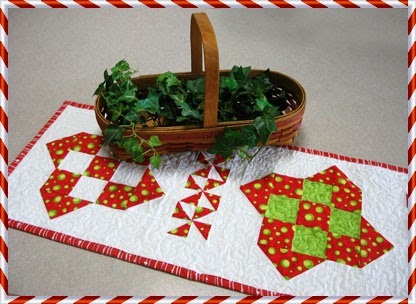 :) I, too think of quilting and designs….to fall back to sleep? I hate to sound like a total dweeb, but I lie there and pray for everyone I can think of that has told me they have a need….sometimes I am still awake as it turns light, other times I have drifted off to slumber. I pray sometimes in the middle of the night, too, Jacque. Sometimes I feel compelled to do it- perhaps God is the One keeping me awake some nights! !